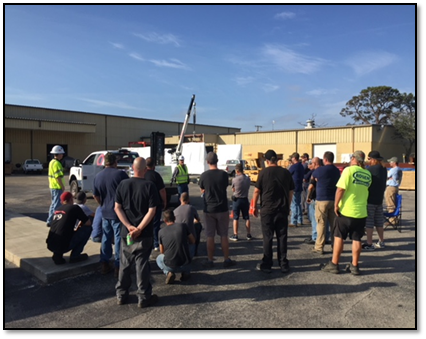 Recently, Leo Marquis, Crosby District Sales Manager and Product Trainer, and one of our strategic distribution partners set up a Crosby On-Site Safe Rigging Clinic with the Crosby Rig Safe, Rig Smart truck with a Florida based end-user. The end-user specializes in custom metal fabrication, CNC machining, EDM (Electrical Discharge Machining), welding, electrical & mechanical design, assembly & finishing services. 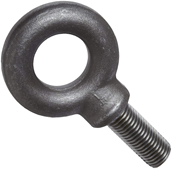 They were using a competitor’s eye bolts for lifting points on various pieces of fabricated equipment. 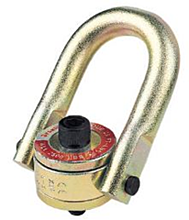 After Crosby trained the end-user on some of the key benefits of Crosby hoist rings over the competitor’s eye bolts, the safety manager made the decision that hoist rings, overall would be a safer option. During the Crosby On-Site Safe Rigging Clinic, Leo was able to educate the end-user on Crosby’s advantages. No need to calculate reduced capacities at different angles. No risk of out of alignment with sling. Crosby offered to provide additional training on the fundamentals of rigging. The Florida based end-user now specs in Crosby HR-125 hoist rings for all their lifting applications. Know your lifting and anchor points! Click Below.